Through MealMatchup, UW students help campus dining halls donate excess food to local homeless shelters. When this question was posed to Madison Holbrook, ’18, in a human centered design and engineering (HCDE) class taught by lecturer Irini Spyridakis, she knew exactly what she’d do: use technology to reduce hunger and food waste. “I thought, ‘There has to be a way to use engineering to help.’” – Madison Holbrook, ’18. Food waste contributes to several social problems, ranging from hunger and malnutrition to environmental and economic concerns. In the U.S. alone, it is estimated that 30-40% of food goes uneaten. 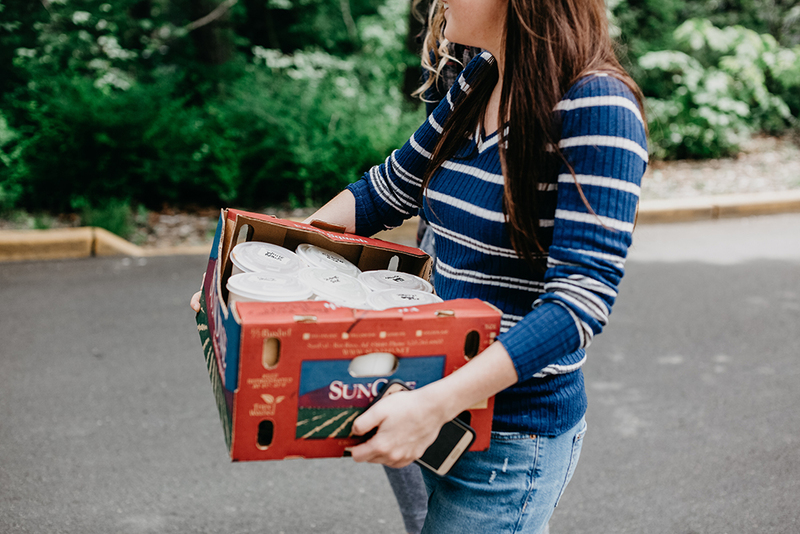 Holbrook noticed a major disconnect between food going to waste on campus and people in need. “I thought, ‘There has to be a way to use engineering to help,’” she says. For her class project she proposed a website that would pair UW dining halls with local shelters to coordinate food donations. Spyridakis encouraged Holbrook to take the concept further, and together they wrote a proposal to the UW Campus Sustainability Fund. Their project was awarded $21,000 to support the creation of a website to connect excess dining hall food with local non-profit agencies that could distribute it to people in need. Over the past year, Holbrook and Spyridakis have led an interdisciplinary research group to develop the concept into a fully-functional web platform. Their team — which has grown to include 33 students from HCDE, the Information School, and the Paul G. Allen School of Computer Science and Engineering — designed the interface for and with the help of three stakeholder groups: UW dining halls, local shelters and student volunteers. The team designed an interface that it is easy-to-use, logistics-focused and clear so all parties can understand each other’s needs and roles. Their web platform, mealmatchup.org, works like this: Food providers log food donations and request pickups online. Food transporters then schedule drivers for pickup and deliveries. Since it’s important to ensure that food donations meets required state guidelines, the transporters are trained in food handling and safety and use the website to document proof-of-pickup and delivery, track food temperatures and navigate pickup and drop-off locations. Receiving agencies use the interface to understand what will be arriving, when, how much and who will be delivering it. To launch the project, team members invested time building relationships and deepening their understanding of stakeholder needs and concerns. On campus they worked closely with UW Housing & Food Services administrators and dining hall managers. They also interviewed managers at more than 50 local homeless shelters, food banks and soup kitchens. Through that assessment, key priorities emerged. Timing, storage and transportation presented the biggest challenges for both the providers and receivers. 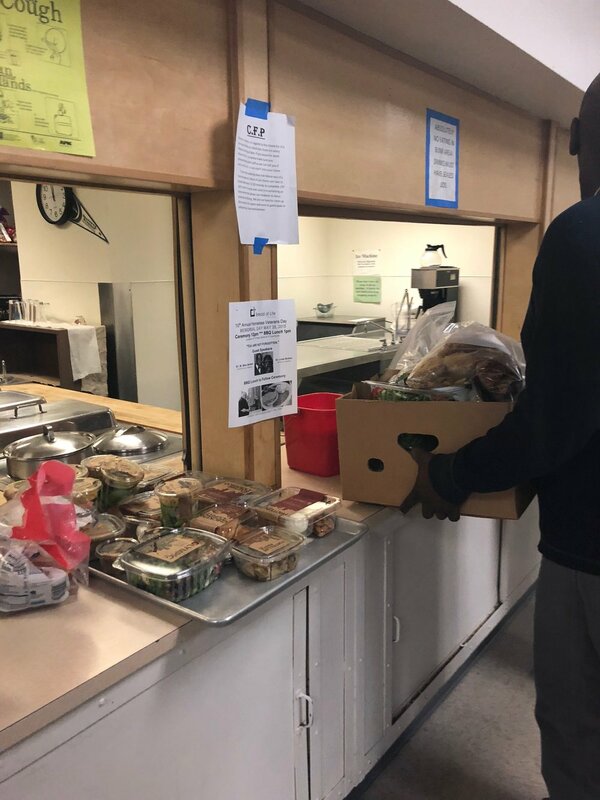 The team piloted Meal Matchup with UW dining halls Local Point, The 8 and District Market and shelters Union Gospel Mission and Compass Housing Alliance. “Dining halls can’t necessarily send their staff to deliver food, and shelters can’t always rely on volunteers to regularly pick up food,” Holbrook says. For help with food transportation, Holbrook and Spyridakis reached out to UW Carlson Leadership & Public Service Center staff and Green Greeks, a student group committed to sustainability. 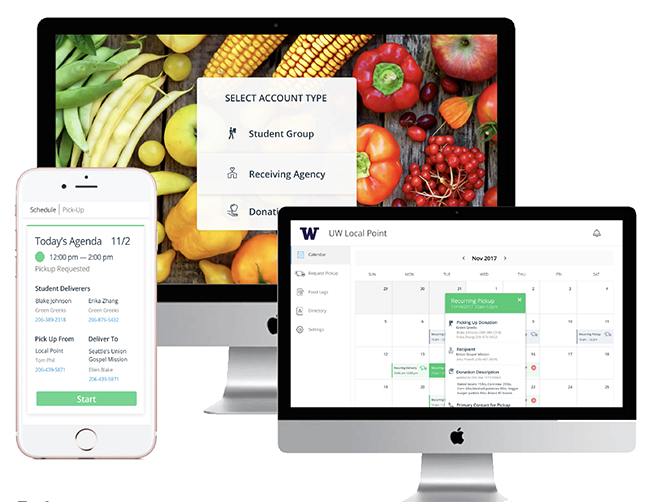 The team piloted Meal Matchup in May 2018 with UW dining halls Local Point, The 8 and District Market and shelters Union Gospel Mission and Compass Housing Alliance. Team members are continuing their outreach efforts and have recently presented their work at international conferences. This fall they will fine-tune their web platform, which they’ve designed to be open-source so that other institutions can use it to create their own food recovery systems. Meal Matchup provides student volunteers with details about food location pickup and drop-off points, so they can make efficient deliveries. “Our goal is that the program will be adaptable, self-sustaining and fully student-run,” says Spyridakis, who will continue to supervise the project. Holbrook is now working as a user experience designer for Hewlett-Packard, and she plans to stay involved with the project as a consultant. She is excited to see campus interest in Meal Matchup grow and to help new students step into leadership roles. Visit Meal Matchup to learn more and get involved.